Cromwell Littlejohn at Merle Wood & Associates is listing the 51.8m motor yacht Marjorie Morningstar for charter in the Western and Eastern Mediterranean in summer 2012. Built by Amels in 2004, her Alberto Pinto interior offers accommodation for 10 guests in a master suite, two double and two twin staterooms plus 13 crew. There's a large range of water toys including two Nautica tenders, two Yamaha waverunners, two kayaks and so on. 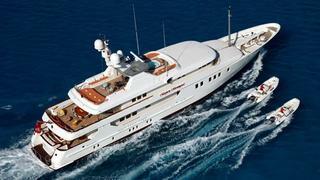 Marjorie Morningstar is available at a rate of €240,000 per week plus expenses.